Anita Hill (left) receiving the 2017 McGarvah Award from TAANA President Randi ﻿Kopf. 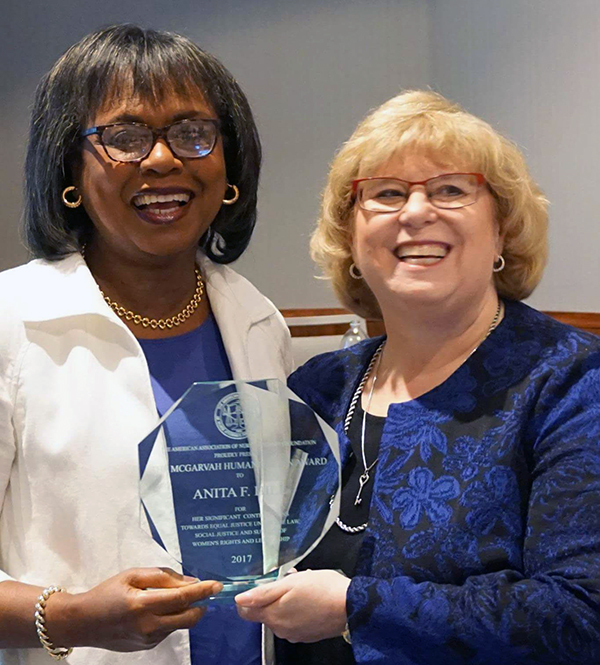 Anita Hill, University Professor of Social Policy, Law, and Women’s, Gender And Sexuality Studies, was recently honored at The American Association of Nurse Attorneys (TAANA) Foundation’s 35th Annual Meeting and Educational Conference in Boston. On Aug. 5, Hill received this year’s Mary Eleanor McGarvah Award, which is granted to an individual or group that has made a significant contribution to the development of health law, nursing and policy. “I am honored to be recognized by The American Association of Nurse Attorneys, and I am especially pleased to receive their humanitarian award named for Mary Eleanor McGarvah, a pioneering lawyer and nurse, who combined her knowledge in both fields to bring greater awareness to the public health needs of vulnerable populations,” Hill said. TAANA is a professional association whose mission is to provide resources, education and leadership to its members and the healthcare and legal communities. Mary Eleanor McGarvah was the first nurse attorney, and she initiated reform and public policy in licensure of midwives, nursing homes and mental health hospitals from 1914 until her death in 1979.